Ramón Esteve Estudio has completed La Finca, a new house that’s located in a residential area of the mountains of Madrid, Spain. Surrounded by lush vegetation and some ancient Holm oak trees, the house was designed around the trees to respect the land. Masonry walls link the home to the ground, while the wood and the Cor-Ten steel recall the trunks of the trees and the surrounding landscape. 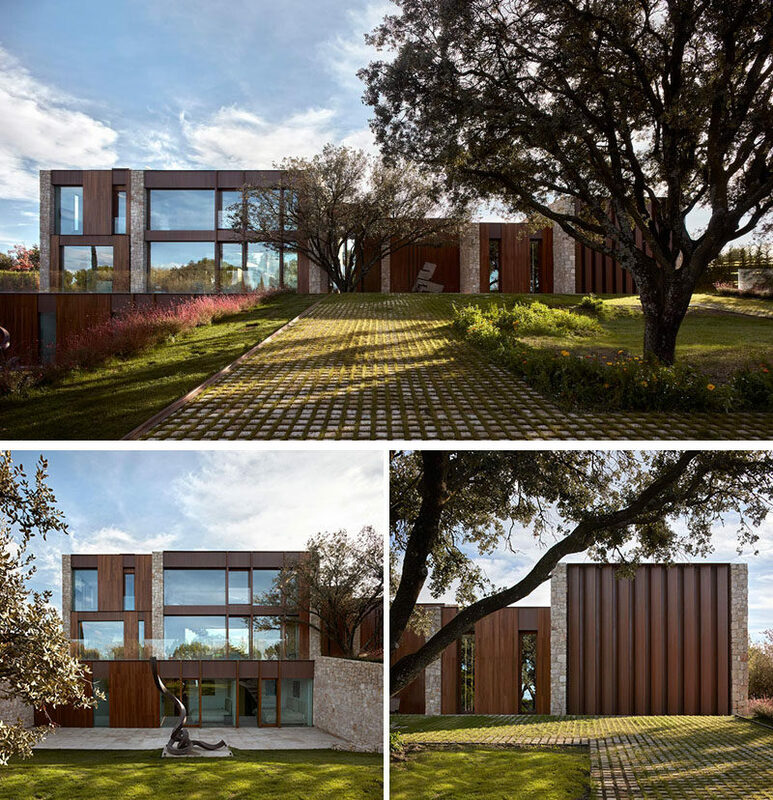 At the rear of the house, it’s easy to see that the design of the house is made up of several boxes that are extended by Cor-Ten steel canopies, creating a large terrace that connects to a swimming pool. Inside, double height ceilings in the living room create an open gallery-like atmosphere, that’s enhanced by the numerous artworks that are found throughout the house. 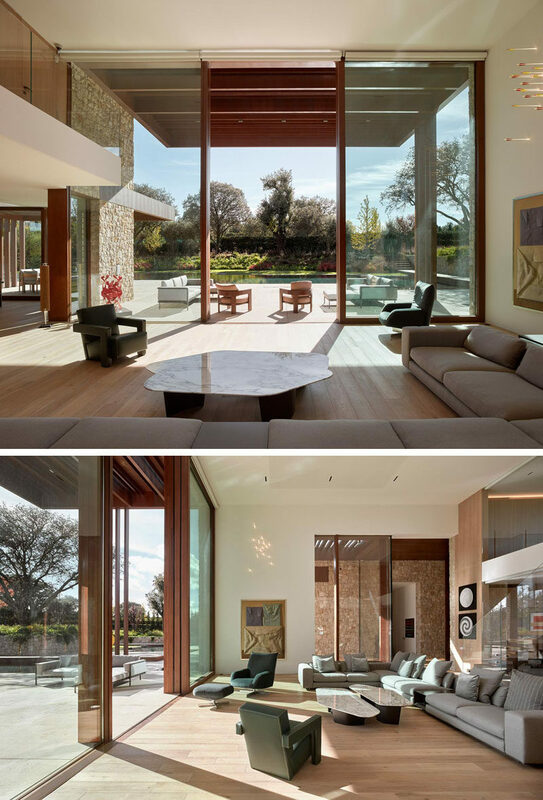 Here’s a closer look at the floor-to-ceiling glass wall that’s adjacent to the living room. 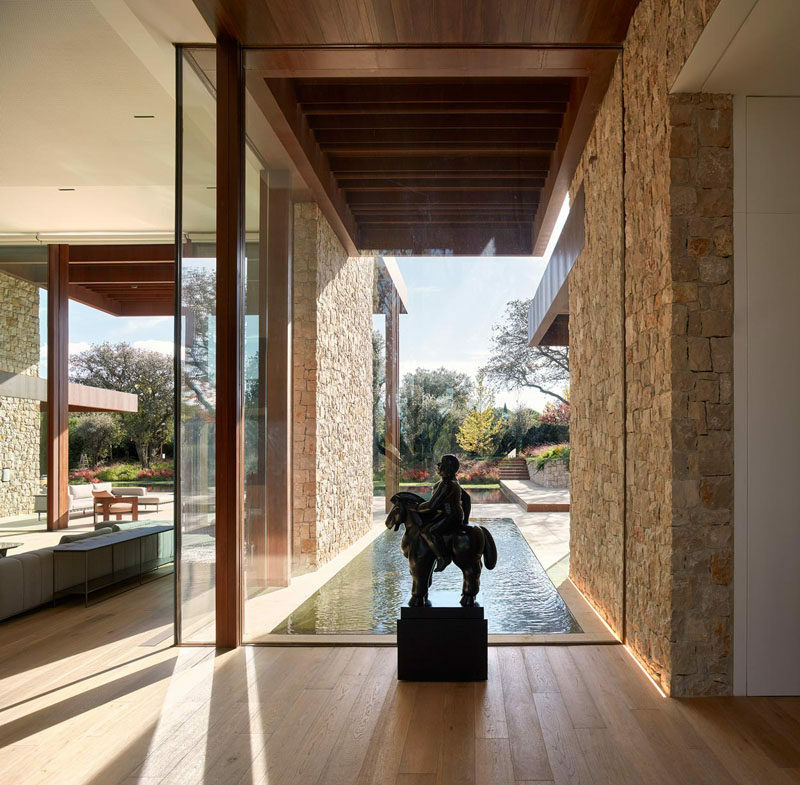 The wall provides a backdrop for a statue, and frames the water feature and garden outside. 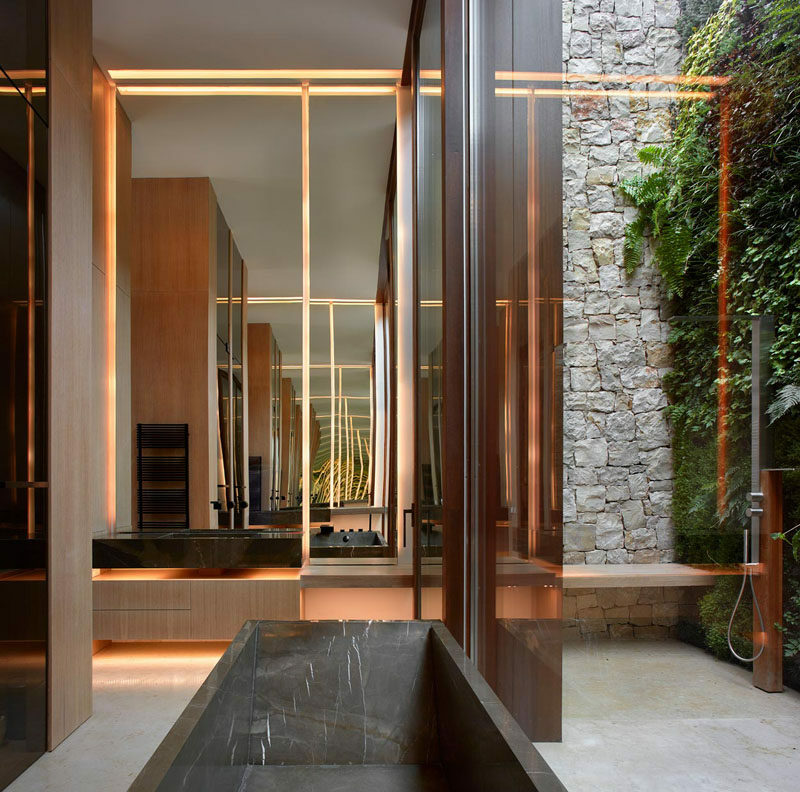 In one of the bathrooms of the home, a tall door opens to a private courtyard with a green wall and an outdoor shower. Wood and glass stairs connect the various levels of the house, from the bedrooms on the first floor to the basement and garage. At the bottom of the stairs is a wine cellar, that has a glass wall to show off the wine as someone descends the stairs. 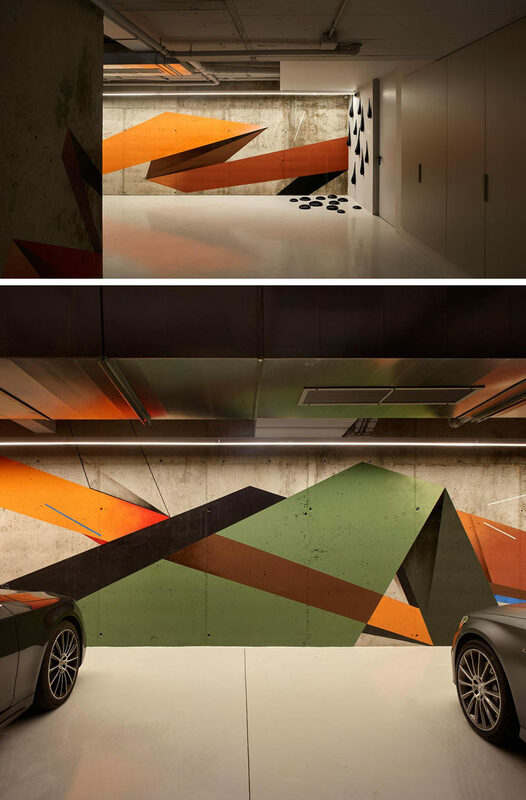 As art is found throughout the home, the garage is no exception, with a piece by the artist Remi Rough featured on the wall, as well as a sculpture by Fred Wilson.